For a very long time, I’ve had an inexpensive, fixed-base router. For almost as long, I’ve wished that I had one of those fancy (…and expensive) plunge-style routers. I always imagined that I could do so much more with one that has the plunging feature, and while that may be true, I was neglecting the fact that there is really a lot that can be done with the one I already had – I just needed to build a table for it! I can’t tell you how happy I am with this build. This has changed the way I work in my shop for the better, and I’m never going back. If I were to eliminate all of the things this router table is good for, except for round-overs, it would still be worth it. Before, I did all my round-overs with sanders, sandpaper, and/or files. This thing makes rounding edges over a breeze, even on smaller parts that would have been impossible to do while using the router “freehand”. I can also use this router for doing dados, which is something that my table saw can’t do (it doesn’t have enough room on the arbor to add a dado stack). And while this is a very small table, and the fence doesn’t allow for much depth, the fence can be removed. If you watch the video, you’ll notice that if the fence is removed, the only thing behind it is my workbench. This means I can clamp a temporary fence at any distance I like, as long as it doesn’t exceed my workbench’s length. This provides more than enough room to make just about any dado you’d ever want to make. The other thing I love about this router table is the compact size. As you are probably aware, I’m very big on making efficient use of time and space. 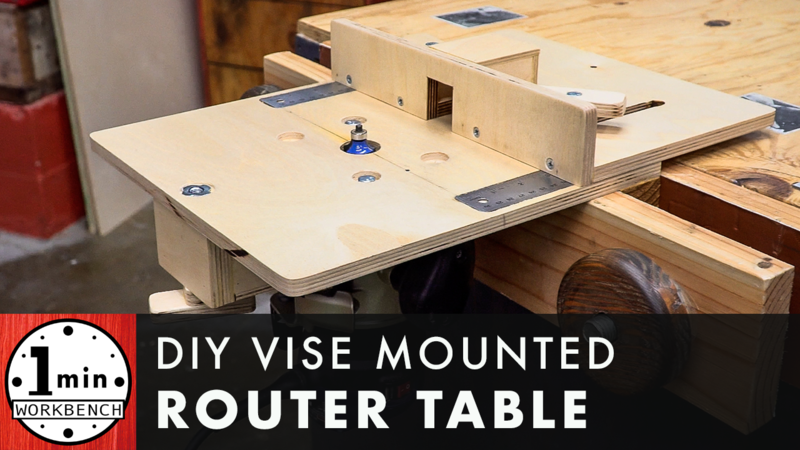 The fact that this router table is vise-mounted makes it to where it doesn’t need all the bulk that that regular router table has. Normally, a router table has to allow room for the router to sit inside, provide feet to hold the table up, and basically just a huge empty carcass around that. That sort of setup takes up a lot of space on a shelf, or under a workbench, but this thing will actually fit in a relative small drawer! I’ve had some time with the router table now, and as I mentioned, I’m already very pleased. That said, I’m still learning about it and look forward to finding more and more ways to use it. If you’ve got any ideas, feel free to share them!